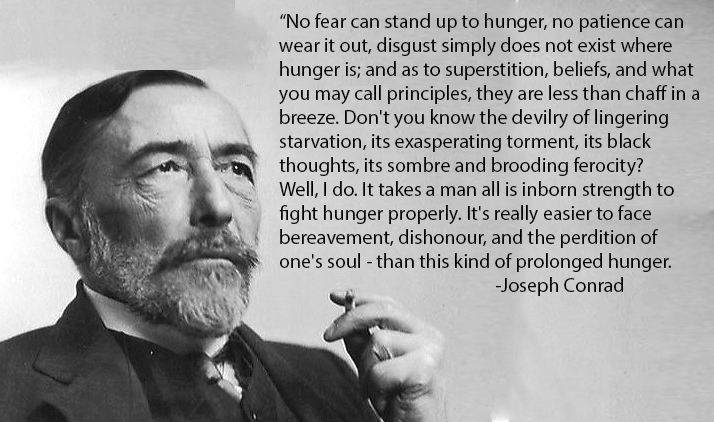 “No fear can stand up to hunger, no patience can wear it out, disgust simply does not exist where hunger is; and as to superstition, beliefs, and what you may call principles, they are less than chaff in a breeze. Don’t you know the devilry of lingering starvation, its exasperating torment, its black thoughts, its sombre and brooding ferocity? Well, I do. It takes a man all is inborn strength to fight hunger properly. It’s really easier to face bereavement, dishonour, and the perdition of one’s soul – than this kind of prolonged hunger.